Weaver Wednesday started in June 2012 to describe each weaver species on a weekly basis, focusing on distribution, subspecies, and breeding notes. The sequence was somewhat random, with one species picked from each genus initially, and then more well known species being covered. Each news item was illustrated with a distribution map, picture of the species, and where possible an illustration of the nest or colony. Weaver Wednesday 1 list - list of species covered in series 1. However, these texts are updated under the Species pages so rather go here. Each news item was well illustrated, usually including the first published illustration of the species, and a map showing the type locality. Many of the texts provide new information. The sequence of species was chronological, i.e. in the sequence that the weaver species were originally described, starting with the Black-winged Bishop. As each news item appeared, it was added to the species summary page, together with the Biology news item (the latter was given headers and sometimes updated). Thus the species page is the most up-to-date site to read any Weaver Wednesday text. Weaver Wednesday 2 list - list of species covered in series 2: click the "Described" option and then the "Sort by" button - the species list will then appear in the order that the species were described. This series shows the changes in distribution for the 25 South African weaver species, based on the changes between SABAP1 (1987-1991) and SABAP2 (2007-current). The series was summarised here. 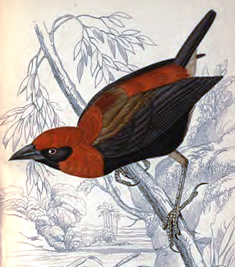 Species list of weavers, showing overall changes in South Africa, with links to the Weaver Wednesday story.